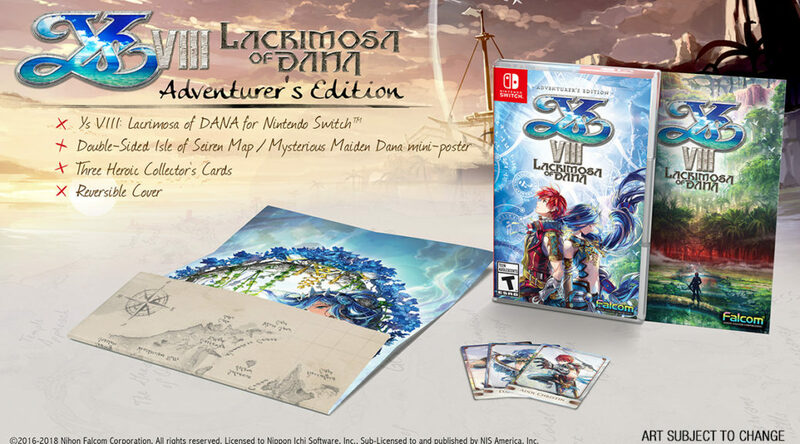 NIS America has released a brand new Ys VIII: Lacrimosa of DANA Adventurer’s Edition for Nintendo Switch today. The Adventurer’s Edition comes with a copy of the game, double-sided poster/map, three collector’s card, and reversible cover. Check out the accolades trailer and details below. We’re proud to announce that our Ys VIII: Lacrimosa of DANA Accolades Trailer for the Nintendo Switch™ is now live! Catch wind of what others are saying about this acclaimed RPG, and get inspired to start your own journey! The Ys VIII: Lacrimosa of DANA Adventurer’s Edition is also available now! This incredible edition comes with a double-sided poster/map, three collector’s cards, and a reversible cover along with the game itself! You can purchase this spectacular deal here!